Bring a little French cuisine right to your own kitchen! It’s time to wrap up my Ode to the Crepe series, but not without providing the finishing touches on your healthy crepe know-how. With this series, I introduced a low-carb crepe, a sweet-filled crepe…and now it’s time for some savory goodness! Use the basic tools that I have provided and come up with some variations on your own using your favorite healthy ingredients. You can add certain ingredients (such as adding raisins to the apple pie crepe filling) or swap ingredients altogether (such as replacing apples with peaches)…there are so many possibilities. To further your expertise and ignite that creativity inside you, I’m going to give you one more variation to these fitness favorite crepes. This week I’m featuring the ratatouille-inspired savory stuffed veggie crepe! You can eat this wrap hot or cold, which makes it perfect for leftovers! What’s more, you can even add chicken or your other favorite meat to increase the protein and enhance the heartiness of this meal. 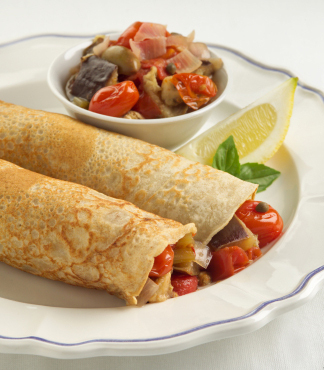 This light crepe is stuffed with a ratatouille-inspired blend of veggies, enhanced with a perfect blend of herbs and spices that will be sure to leave you feeling as if you’re at a French café… and trust me, love will be in the air! This meal is packed with nutrients and fiber to leave you satisfied and energized throughout the day. As we know, keeping our bodies in shape is hard work… and, yes, it absolutely does mean making sacrifices when it comes to the foods that we choose to eat! However, the key is to still enjoy the foods that you love by simply recreating them into a healthy version. That’s what I’m here for! I’ll take the guesswork away from you and bring you new recipes each and every week! It’s all about ingredient swaps! The key to this recipe is swapping the white flour with oat flour, butter with coconut oil, whole milk with almond milk, and choosing the filling ingredients wisely. You won’t miss the original ingredients one bit! It’s amazing what a few simple tweaks can do! It’s all about creativity, my friends, and I’m excited to provide you with the know-how to do this on your own! Don’t be nervous to re-create some of your favorite recipes once you get the hang of it! You don’t have to suffer in order to eat healthy— it’s all about taste without the guilt. As my trademark proclaims, I will always do my best to deliver to you: 100% Taste, 0% Guilt! FILLING: Heat coconut oil in a large sauce pan over medium heat. Add ALL filling ingredients and let simmer for about 15-20 minutes or until veggies have softened and liquid is absorbed. Turn up the heat and let veggies brown, approximately 5 minutes, stirring occasionally to prevent sticking to pan or burning. Remove from heat and set aside. CREPES: Put whites, almond milk, oat flour, garlic and basil into a blender. Blend until smooth. (If you don’t have a blender, you can use a whisk but be sure to blend very well until batter is completely smooth.) Coat 10’’ skillet with non-stick cooking spray and put over medium-high heat. The KEY here is technique!! Pour approximately ¼ cup of the batter onto the skillet and swirl all around to cover the bottom of the pan in a very thin layer. After approximately 1 minute, or once it starts to bubble and bottom is golden brown, flip crepe over and scoop ¼ of the veggie mixture onto the center of the crepe. Cook for an additional 30 seconds or until underside is golden brown. Fold one side of crepe over and roll to seal in the mixture (creating a rollup). Put on plate and repeat this process with all 4 crepes. NOTE! As you continue cooking, the pan will get hotter so it will take less time to cook each one. ENJOY!